House Speaker Gloria Macapagal Arroyo on Monday arrived in Bohol to lead the orientation on the implementing rules and regulations (IRR) for Republic Act 10969 or the Free Irrigation Services Act. 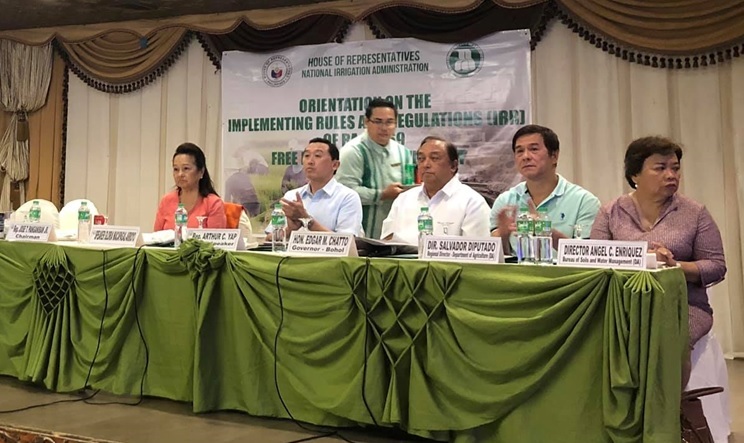 The law’s IRR was presented to the public, including farmer and irrigator associations, during the orientation at the Bohol Tropics Resort in Tagbilaran City. National Irrigation Administration (NIA) administrator Ricardo Visaya and House Committee on Agriculture and Food chairman, ANAC-IP Rep. Jose Panganiban Jr. also joined the event. The Free Irrigation Service Act was signed into law by President Duterte in February, last year. The law stipulates that farmers with landholdings of eight hectares or less are exempt from paying irrigation service fees for water derived from national and communal irrigation systems. “The State shall also ensure that vital support services are made available, particularly irrigation service, through the continued construction, repair and maintenance of necessary irrigation facilities, to increase production of agricultural crops, encourage productivity, and increase the incomes of farmers,” the law states. However, farmers with more than eight hectares of land, as well as corporate farms, plantations, fish ponds, and persons using irrigation systems as drainage are not covered by RA 10969. “Towards this end, the State affirms its commitment to contribute to the lowering of the cost of production through the provision of free irrigation service, and further relieve the farmers and their irrigators associations from the burden and consequence of unpaid irrigation service fees,” according to the law. Also present during the event is known Arroyo ally Deputy Speaker Arthur Yap who authored the House of Representatives’ version of the then-proposed legislation on free irrigation services for poor farmers.